Dani is my first GSD. I can't believe how smart she is already. She is 7 wks old and I taught her how to sit and give paw. I'm amazed. 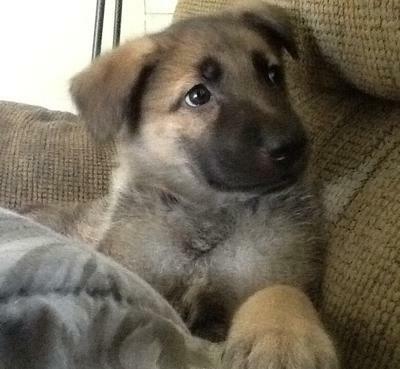 Dani, your new German Shepherd Puppy, she is absolutely beautiful. And so pretty too. What a stunning little girl she is! And you haven't seen anything yet in how smart these dogs are! Do your best to get her into some training classes as soon as you can. These dogs are little sponges waiting to learn new things to do. 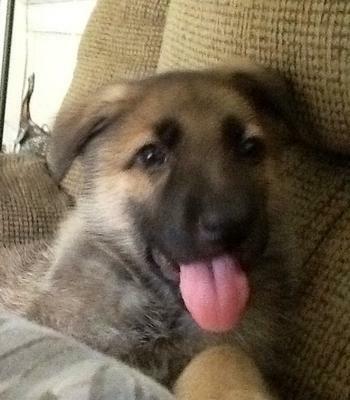 Make sure you keep her up on her shots and wormings, get her into a training class soon and socialize her from now on and you will have one well adjusted little German Shepherd Puppy! Continued success with her! And if you get the chance, maybe you can send us some more German Shepherd Puppy pictures sometime down the road because we would love to see how she matures. That beautiful sable coat is probably going to change colors several times before she's completely mature and we'd love to see how she ends up! Look at that precious little face, Dani is so cute. German Shepherds are Amazing you'll see. She will be Protective, Loyal and Trustworthy and Loving. Enjoy this puppy year, it is so important with all Love you can give her to make her the Best that she can be. Take care of you girl, Dani and she will take care of you.